For nearly 50 years, Don Morales has given his time and talent to support the needs of individuals with intellectual or developmental disabilities. At 84 years old, Don currently serves as the Treasurer on AdvocacyDenver’s Executive Board. However, his history of service does not begin there nor does it end there. He has logged countless hours of volunteer time over the decades in order to raise funds and improve services for our community. How did you become involved in service for the community of individuals with disabilities? I had my child in Hope Center, a school for children with disabilities. I was active because we were having to remodel a building they were going to use at North Clayton Learning Center. The Secretary of the Parents Organization asked me if I would come to a meeting. I did and they talked me into joining. I knew it was going to do good for kids with disabilities. Being as I had a son, I wanted the best for him. I didn’t expect to be on the Board but two years after I joined the Parents Organization for Hope Center, I became President. Then I came to three meetings for the Arc. (It was Arc Denver when I first started.) They talked me into being on their Board. That was in 1971. A couple of years later, I was representative for the Denver Arc on the Arc Thrift Stores Board. I stayed on the Board there for 11 years. 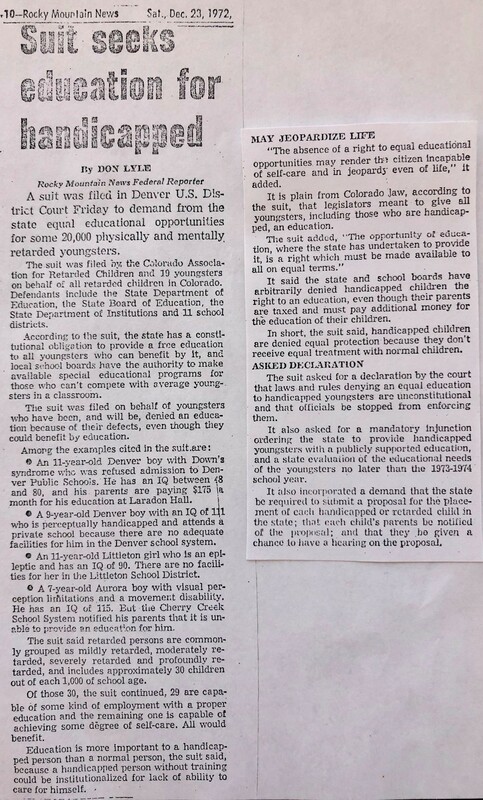 A 1972 article in the Rocky Mountain News covering the suit brought against Denver Public Schools (click for full size). What changes have you seen in the field during Danny’s 56 years? A lot of the changes I saw were in the public school system. We filed suit against Denver Public Schools to include all kids with disabilities. That was in 1972. I’ve seen progress in that all children go to public schools. When they first started, they were putting children with disabilities in the basement of the school. They were segregated. Now they are actually in the regular classes. What do you think your greatest contributions have been to AdvocacyDenver? I’ve been able to recruit quite a few Board members and regular members to AdvocacyDenver. I’ve done a lot of fundraising. I’ve been advocating to make sure we keep the (Arc Thrift) stores going. The stores have supported us. If it hadn’t been for the Arc Thrift stores, I don’t know how we would have existed. That has been one of my biggest goals–to make sure we keep the Arc stores going. My hope is that we can keep AdvocacyDenver going forever. The state and the federal government don’t do the hands-on advocacy. The advocates are active with the individuals and their families. They see them every day. They continue to try to handle whatever problems come up for them. My real hope is that we can continue doing this until, I would like to say, there’s no more need. Is your son still the reason you continue to be involved? He’s lived with us for 56 years. We never wanted to put him any other place. A lot of people tried to talk me into putting him in a host home. I figured we were able to take care of him. He was pretty functional to start with. It’s been about five or six years since he started getting dementia. Now, I’m sure it’s Alzheimer’s. It’s getting harder but we want to take care of him until the good Lord takes him. We don’t want to put him in any other place. 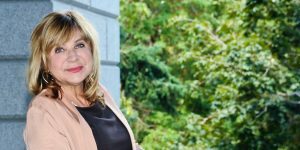 Has having your son Danny changed your life? Yes. It was just something that happened. We were in our 20’s. My oldest son was born and he was in perfect health. Danny was born two years later. He was born with Down Syndrome. And he was the greatest thing that happened to us. He has kept the family together. Because of Danny, I got involved with AdvocacyDenver. I don’t think I would have ever been involved if it hadn’t been for him. I believe that it is important to know where you have been in order to know where you are going. It is important to take a minute to learn more about our history. The first agency in Colorado to have any responsibility for caring for children with disabilities in the schools was the Child Welfare Bureau under the Board of Control, established in 1919. It was not until 1932 that the Bureau began to place a major emphasis on identifying the welfare of children with disabilities in the state. In 1928, the first class for the deaf and hard of hearing was established in Denver. 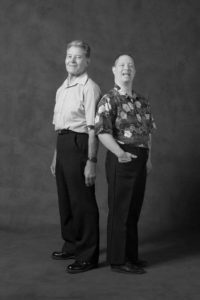 AdvocacyDenver was founded in 1954 by a group of parents of children with intellectual or developmental disabilities and was one of the first Arcs in the United States. In 1954, 1964, 1973… the agency for all of the Arc’s included a term that is no longer acceptable, the “R” word. The Arc of the United States and each chapter have lobbied to rid public law of the “R” word as well as the “H” word. 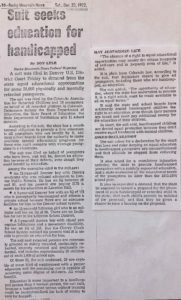 For this Edition of the Voice, we thought it was important to include an article that appeared in the Rocky Mountain News in December of 1972. It speaks to our history, it reminds us that in 1972 children with disabilities did not have a right to attend public school. My heroes and sheroes are the parents who came before me who stood firm and lobbied, petitioned, advocated and brought litigation to demand the education of children with disabilities. Each generation going forward stood firm and insisted that their children, brothers, sisters, students, their neighbor be provided equal access to education, community, employment, health care, marriage, housing… Each generation has and continues to raise the bar and helps us recognize what is possible when our children with and without disabilities are educated in the same classrooms, when inclusion is the norm.